Computer science professor Juan Gilbert demonstrates the Prime III voting system. The system allows the disabled to vote securely and independently while eliminating ambiguities left by stray marks and hanging chads. 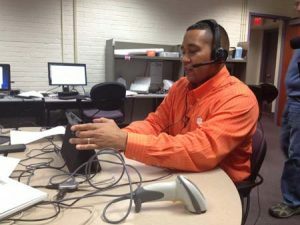 CLEMSON, S.C. — New voting technology that was pioneered by a Clemson Universitycomputer science professor soon will be deployed to Wisconsin and Florida for pilot programs that he expects will begin to revolutionize how voters nationwide cast ballots. Juan Gilbert said that his team’s voting system, Prime III, will allow the disabled to vote securely and independently, while eliminating ambiguities left by stray marks and the now-infamous hanging chads. Gilbert, 44, is featured in the magazine Diverse Issues in Higher Education as a member of the “Alum Class of Emerging Scholars.” The edition was published Thursday. The magazine named Gilbert an “Emerging Scholar” in 2002, making him a member of the inaugural class. He is now a Presidential Endowed Professor and chairman of Clemson’s Human-Centered Computing Division. Prime III is the first known voting system to make full use of speech capabilities, allowing hands- and eyes-free interaction. The system will be sent to a few precincts in Wisconsin on April 1, marking the second time it is used in a binding statewide election, Gilbert said. Several rehabilitation and independent-living centers in Oregon used Prime III in the 2012 presidential primaries, he said. Prime III allows voters to cast ballots by tapping a touchscreen or speaking into a microphone. Those who can’t articulate a candidate’s name have the option of blowing into the microphone. The system also includes a set of headphones and audio instructions for voters who have trouble reading or seeing the screen. People with disabilities now vote in “accessible voting machines,” Gilbert said. As part of Prime III, a blank piece of paper is put into a printer for each voter. The ballot is printed, showing only the contests and who was selected to eliminate potential confusion about voter intent. The paper goes into a ballot box and is later scanned. A manufacturer has picked up the technology, he said. Gilbert and his team will do usability studies this semester as part of the manufacturer’s certification through the U.S. Election Assistance Commission, he said. Another project, Voter Pass, could be rolled out in a pilot program in a Richland County election in March, Gilbert said. The system allows voters to call days before the election to make appointments to vote. When they arrive, one line will be for voters with appointments and another for those who didn’t. Another development is the Televoting system that will be used in a pilot program in Okaloosa County, Fla., Gilbert said. It will allow overseas military personnel to vote securely and privately, he said. Gilbert said his work on voting systems began when he was at Auburn University in 2003. Florida’s problems with voting in the 2000 presidential contest were still on his mind when he heard someone at a conference say that computers couldn’t be used for voting. It struck him as pessimistic, and he immediately went to work. A $4.5 million grant from the U.S. Election Assistance Commission in 2011 helped pay for development of Prime III. Gilbert’s work goes beyond voting. He is working on Project Hero, which he said will help solve gun violence. Gilbert also has begun a web-based reality TV show, Lab Daze, about his lab as part of an outreach to middle school students. “Clemson University is unique in that we’re home to the largest group of African-American Ph.D. students in computing,” he said. Gilbert is a fellow in the American Association for the Advancement of Science and is a recipient of the National Science Foundation’s Presidential Award for Excellence in Science, Mathematics and Engineering Mentoring. He lives in Anderson with his wife and their two sons, 10 and 6.